After averaging 14 points through the first six games, Kyrie Irving knew he was due to start hitting some shots. 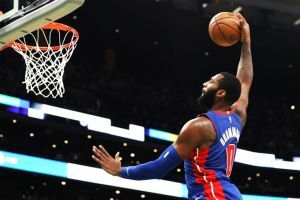 Irving broke through Tuesday night with a season-high 31 points and led a third-quarter surge that put Boston in command of a 108-105 win over Detroit, handing the Pistons back-to-back losses after a 4-0 start. 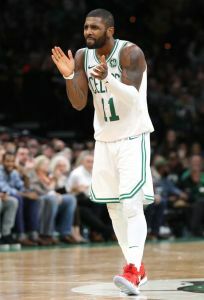 Irving’s effect on the game showed in the box score as well with four of his teammates also scoring in double figures as the Celtics won their third straight. Jayson Tatum scored 16, Jaylen Brown had 14 points and Al Horford scored 11 for Boston. Marcus Morris had 15 points and nine rebounds. Irving’s previous high this season was 22 last Monday against Orlando. He scored just three Saturday when the Celtics beat the Pistons 109-89. 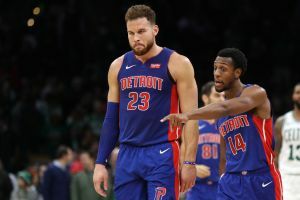 Blake Griffin had 24 points and 15 rebounds for Detroit, which couldn’t recover after scoring just 13 points in the third quarter. 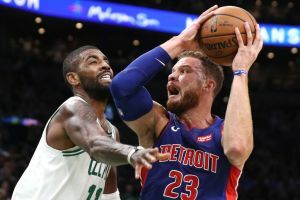 The Pistons chopped Boston’s 14-point lead down to a point with 4:21 left to play, and then again with 12 seconds remaining, but couldn’t complete the comeback. Boston is still the only team to beat the Pistons this season. “We had to pick our energy level up,” Brown said. The Celtics thought Drummond interfered with the ball while it was on the rim and called for a replay, which didn’t happen but did get coach Brad Stevens a technical for coming out on the court to argue. 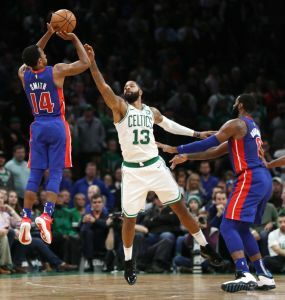 Bullock made the foul shot to pull Detroit within a point, but Boston responded again with six straight points. Pistons: Drummond and Griffin scored 12 points apiece in the first half. … The Pistons exercised the club option on the contract of G Luke Kennard through next season. Kennard was inactive Tuesday with a sprained right shoulder. … Detroit outscored Boston 30-25 in the second quarter and led 58-56 at halftime. … Griffin picked up his fourth foul with 2:22 left in the third quarter. Celtics: Irving’s previous season high was 22 points. … F Daniel Theis was out with a plantar fascia tear in his right foot. … Horford was called for a three-second violation twice in the first quarter.